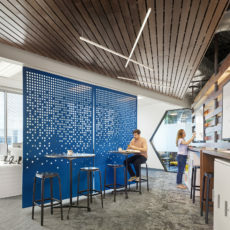 Open and collaborative environment with blended pockets of non-address private areas and breakaway spaces; bright color-blocked zones for wayfinding, workstations set at a diagonal to create neighborhoods, teaming areas of various sizes tailored to different meeting styles. 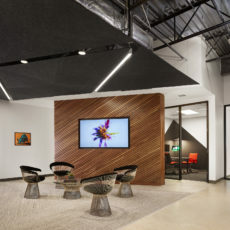 Ancillary settings with specific identities support the project’s design concept of the Austin music scene, while providing variety and choice for Informatica staff. 40,000 sq ft including 220 Workstations, 20 Work Rooms, 8 Team Rooms, 5 Casual Meeting Rooms, 9 Phone Rooms, 2 War Rooms, 4 Conference Rooms, 1 Reception Area, 2 Large Kitchen/Café Areas, 1 Multi-Purpose Room, 9 Open/Collaborative Areas, 1 Game Room, 3 Large Retreat Spaces, 1 Mother’s Room. 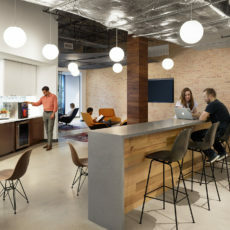 Herman Miller Renew Link workstations, Mirra 2, Sayl and Setu seating, Meridian Storage, Layout Studio project and Exclave tables. 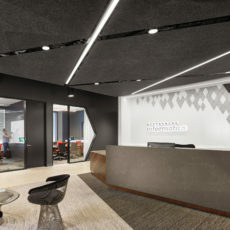 Herman Miller Elements including Herman Miller Collection, DWR, Naughtone and Geiger. 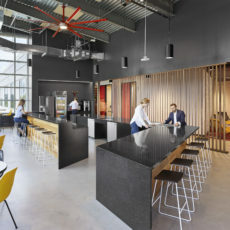 Various ancillary manufacturers – Spacestor, Andreu World, Davis, Sandler, Nienkamper, Hightower, Stylex, Heartwork, Gus Modern, Bludot, Bend Goods, and custom tables by Creative Wood. Accessories by DWR, Arhaus, Stag Provisions, and Umbra.